Spa and med spa businesses are always looking to strengthen relationships with clients. How you connect with clients, solidifies credibility and trust that translates into continued financial success. However, a major challenge many businesses face is identifying the right strategies to help build long lasting relationships and overall reputation. One effective action plan can be to offer your clients payment options, like the CareCredit credit card. Offer your clients payment options that include special financing options like the CareCredit credit card, with no interest if paid in full within the promotional period*. This helps them identify how to pay, with a selected option that best fits their needs. With budget-friendly monthly payments, spa owners can also help clients choose service enhancements and add-ons without cutting the price of the service to show value. With a dedicated way to pay, clients will understand the pricing for their treatments, and trust their spa or med spa providers. This may also entice clients to elevate or increase services and return for follow up treatments. Most spa clients may not have a fixed budget for covering the costs of the beauty, spa and wellness treatments that they want or need. The CareCredit credit card offers spa clients a convenient payment option so they can fit more spa services into their budget. Promotional financing options are available for purchases of $200 or more. CareCredit offers cardholders access to a calculator tool so they can easily review average monthly costs. In turn, clients will feel valued knowing their spa and med spa provider has their best interest in mind. Give your marketing materials an overhaul. Update exclusive offers and eblasts touting the latest and greatest offerings or promotional specials; and make them even more exciting by noting that the CareCredit credit card is a payment option for them. By offering value and information about a payment option with promotional financing options, clients will feel like they are receiving a special offer. As a result, they may schedule services and return visits. CareCredit works with more than 210,000 providers across a broad range of specialties including medical care, beauty, dental, optometry, hearing and veterinary services. 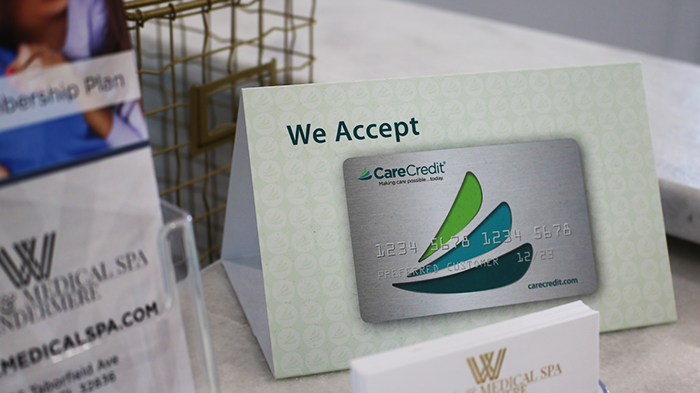 With CareCredit’s 11 million cardholders, spa and med spa businesses can get connected to a new client base, while providing optimal service for current clients. Visit Carecredit.com/providercenter now to learn more and enroll so you too can offer your clients CareCredit as a preferred payment option. *Subject to approval. Minimum monthly payments required. See carecredit.com for details. **No interest will be charged on the promotional purchase if you pay the promotional purchase amount in full within the 6, 12, 18, or 24 month promotional period. If you do not, interest will be charged on the promotional purchase from the purchase date. If your purchase qualifies for a 24-month promotional offer, fixed monthly payments are required equal to 4.1667% of initial promotional purchase amount until promotion is paid in full. The fixed monthly payment will be rounded up to the next highest whole dollar and may be higher than the minimum payment that would be required if the purchase was a non-promotional purchase. For all other promotional offers, the regular minimum monthly payment terms of the account will apply. Regular account terms apply to non-promotional purchases and, after promotion ends, to promotional balance, except the fixed monthly payment will apply until the promotion is paid in full. For new accounts, Purchase APR (interest rate) is 26.99%. Minimum Interest Charge is $2. Existing cardholders should see their credit card agreements for their applicable terms. Subject to credit approval.